2015 Award Winners. Left to Right: Greg Cole (Cole’s Chop House), Barbara Wiggins (The Mustard Seed Clothing Co.), Don Rickard (Platypus Tours), Kathleen Dreessen (Napa Valley Community Housing), Ben Koenig & Jason Kupper (Heritage Eats), Steve Carlin (Oxbow Public Market). Photo by Art & Clarity. Incoming NCC Board Chair Kevin Teague calling meeting to order. Photo by Art & Clarity. Napa businesses and community leaders were recognized for business excellence and community impact at the Napa Chamber of Commerce’s 2015 Business Awards on Friday. 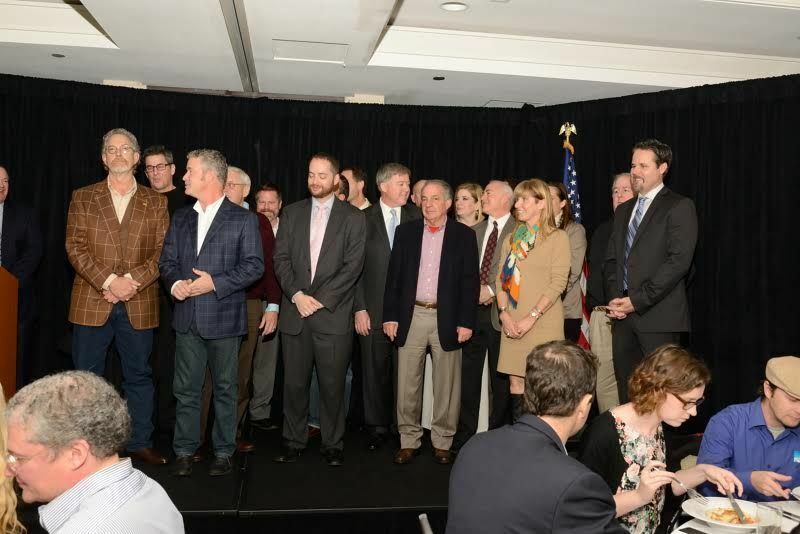 A result of the collaborative work of Chamber staff, members, community leaders, stakeholders and local elected officials, the Annual Meeting and Awards honored a 127-year tradition, providing an opportunity for everyone to connect and collaborate. Award winners were announced live in the Westin Verasa’s grand Amphora Ballroom in downtown Napa by emcee Tim Roye, also known as the “Voice of the Warriors,” while video footage featured words of encouragement and praise from friends and colleagues. Among the crowd were many county and state dignitaries, including Napa mayor Jill Techel and state Sen. Lois Wolk. The chamber presented the retiring Wolk with an award of special thanks to mark her many years of service to the district. HERITAGE EATS is the 2015 Small Business of the Year, sponsored by Mechanics Bank. OXBOW PUBLIC MARKET is the Large Business of the Year, sponsored by Pacific Gas & Electric. BARBARA WIGGINS, owner of The Mustard Seed Clothing Company, is Citizen of the Year, sponsored by Silverado Resort and Spa. GREG COLE, famed Napa restaurateur and owner of Cole’s Chop House, is the Member of the Year, sponsored Napa Valley Transportation Authority (NVTA). The Member of the Year Award is new to 2015. DON RICKARD, owner of Platypus Tours, is the Customer Service Person of the Year, sponsored by RSA+. KATHLEEN DREESSEN, executive director of the Napa Valley Community Housing (NVCH) is Ambassador of the Year, sponsored by the Napa Chamber of Commerce. The Napa Chamber represents about 1,100 members and over 27,000 employees among Napa Valley’s businesses and charities. “Our Annual Meeting and Awards give them the chance to celebrate one another in a very public way, ” said President/CEO Travis Stanley. 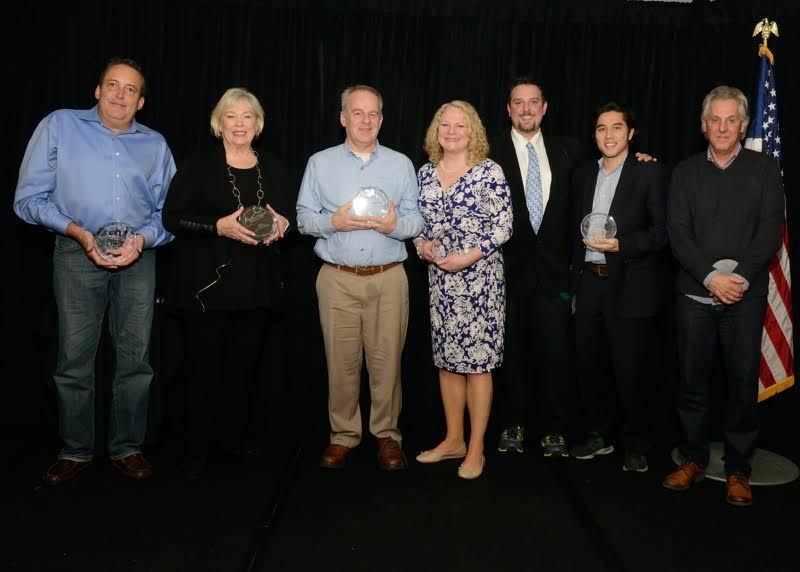 The 2015 awards ceremony marked significant growth in member participation: Nearly 2,000 votes were counted for this year’s award honorees. Also named at the event were the Chamber’s 2016 Board of Directors. The 2016 Executive Committee includes: Kevin Teague (board chairman), Ken Frank (past board chairman), John Evans (vice chairman), Pamela Gleeson (Treasurer), Paul Hicks and Richard Rybicki. Additional directors include: Michael Basayne, Greg Cole, Christi Coors Ficelli, Michael Downer, Gary Garaventa, Jeri Gill, Eron Hodges, Michael L. Holcomb, Georgene Lichau, Jason Luros, Michael Murray, George Nielson, Mark Pope and Mick Salyer. In line with the sold-out event’s theme of “collaboration,” community-driven winery Humanitas, also the event’s sponsor, announced its pledge to donate 20 percent of all wines purchased by Chamber members to be given back to the Napa Chamber Foundation through the end of summer. As the membership organization for business, the Napa Chamber of Commerce promotes the town’s economic vitality and quality of life through leadership development, advocacy, facilitation and education. For more information or to become a member, visit napachamber.com.